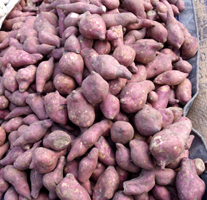 Boniatos, also known as Cuban sweet potatoes,feature dry, starchy flesh underneath the reddish-brown skin. They have mildly sweet flavor and cooked in similar fashion like potatoes. Sweet potato leaves, indeed, are more nutritious than the tuber itself. Weight per weight, 100 g of fresh leaves carry more iron, vitamin-C, folates, vitamin-K, and potassium but less sodium than its tuber.